I moved to New Mexico in the summer of 1994, and I brought with me a habit-forming vice, something that I kept secret from my new employer. As a college basketball coach, I figured none of my colleagues at New Mexico State University needed to know I had been studying the fiddle for six months. Learning to play folk music by ear was so invigorating that I didn’t bother to bring a television in my U-Haul. My native Chicago had a rich history of traditional and noncommercial music. I got very interested in “old time” fiddling, as well as the vital Irish music scene that still exists there. But I couldn’t find a traditional-music scene in Las Cruces. I took an apartment in historic Mesilla, right next to Las Cruces, for $400 a month, and each night, rather than tuning in to Letterman or ESPN, I got to work building my own imaginary little folk music world, trying to copy the fiddle music on CDs. It’s hard to master any musical instrument, and without a real teacher it’s a sort of fool’s errand. But I was a happy fool, and so I relentlessly sawed away each night. In 1996, I started a string band, the Deming Fusiliers, although none of us were from Deming, and to the best of my knowledge, none had served as a fusilier. 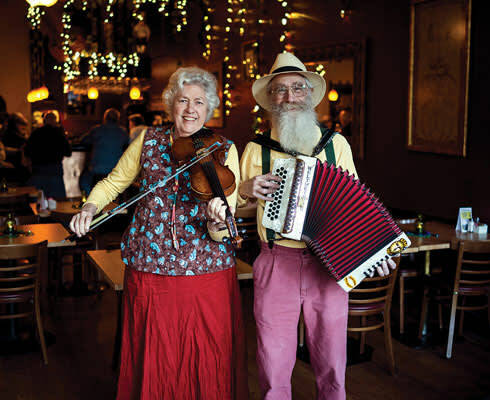 We’d get modest gigs at High Desert Brewing Company, or we’d play the monthly “contra dance,” a New England tradition that academics spread around after the folk revival of the 1960s. These gigs were more a testament to the infancy of the local trad music scene than to how good our band was. There was something missing from the music. I wasn’t raised in the mountains of West Virginia, or in old Ireland, so my fiddling, even if it was improving, always felt remote and thin. How could I connect musically to my new home and life in New Mexico? I needed somebody—a living person, a local musician—to show me our equivalent of the dance music traditions of Ireland and Appalachia. How would they translate into—well, into New Mexican? In 1997, I went to a dance in Mesilla, but I didn’t bring my fiddle—I went to dance. Mesilla is one of the oldest towns in New Mexico, and the community center has a lovely wooden floor. The featured band that night was rumored to be fluent in the traditional fiddle music of our state. Whatever that meant. That was the night that changed forever my relationship to music. The band, Bayou Seco, seemed to have walked off the pages of an R. Crumb comic book. Ken Keppeler, an East L.A. native, had a beard of Old Testament proportions, and he wrestled with his accordion as if it were an escaped alligator. His wife, the fiddler Jeanie McLerie, originally from New Jersey, of all places, had a wild bowing hand and the energy of an overcaffeinated teenager. They’d moved to New Mexico from Louisiana when Jeanie’s doctor told her the dry air of the Southwest would improve her asthma. How could a band be just two people? When the band took a break that night, I approached the couple and told them what a joy it was to dance to their music. Their New Mexican songs and dances sounded happy. Kid-at-Christmas happy. The next morning, I woke up with one of those tunes in my head. The phone call two weeks later was a surprise. Each week, one half of the Bayou Seco duo would stop by to teach me the fiddle music that is unique to New Mexico. No money changed hands, just the quirky and lively tunes that they’d learned—much of it would have been lost without their efforts to keep it alive. They have a Johnny Appleseed approach to their art, spreading it around generously. Nothing was of value to these two, it seemed, unless it was given away—an old idea about music and art that is all but forgotten in most circles. Also unusual about Bayou Seco is their sense of democracy and community. They’ve taught the New Mexico tunes to hundreds of children statewide over the years. And anyone who professes to be learning an instrument or interested in their music is in danger of being thrust in front of a live microphone. That’s what happened to me: Within a few months of meeting them, I was joining the band onstage. Bayou Seco is also unique in this regard: They never talk about themselves. They want to tell stories about the great New Mexican musicians they’ve learned from. Like the fiddler Cleofes Ortiz, who’d be over a hundred years old if he were still around. Or the legendary accordion player Antonia Apodaca, the musical equivalent of a human jalapeño, who’s still banging out tunes today in her nineties. Or Cipriano Vigil, whose finger work on guitar or fiddle is a breathtaking ballet. Or even the Lewis brothers, J.P. and Pete, who were raised in Crow Flat, in southeastern New Mexico, who have kept their family’s fiddle tradition alive in one of the most remote parts of the state. Although neither McLerie nor Keppeler can claim New Mexico as their birthplace, Keppeler’s ancestors were early settlers (and musicians) in the territory before it became a state. And the fact that they’ve been heroic in helping to keep a waning tradition alive and healthy has deflected any questions about their right to perform their brand of New Mexican music. McLerie and Keppeler are barely into their seventies now, just kids compared with their musical heroes. But the traditions they represent are much older, and among the most authentic in our state. If you want to hear a New Mexico blend of Spanish colonial, Native American, and a dollop of cowboy and Cajun—and you feel like dancing—Bayou Seco is the band for you. You’ll identify the deep New Mexican roots of the music: polkas, cuñas, breakdowns, schottisches, valses. And sure, they may take on the spice of a Louisiana two-step, an Appalachian clog dance, an Irish jig, or a Yiddish freylekh. Their New Mexico music is a currency, passed from old to young, and often crosses invisible lines of culture, tradition, and geography. The old country music group the Carter Family used to say, “You may forget the singer, but don’t forget the song.” That seems to be what Bayou Seco is up to.